When it comes to foam board insulation products, there are a few different options on the market. However, as you may have noticed in your own research, not are all created equal. Some foam board insulation products have distinct advantages in performance, environmental impact and cost. Perhaps you’re already aware of your options but need more information in deciding what the better foam board option is: graphite polystyrene (GPS) or extruded polystyrene (XPS)? While GPS is a newer product in North America, it’s quickly becoming the new standard in thermal insulation. It’s also been the leading choice of insulation across Europe for several decades. This blog post will explain the differences between the two and (spoiler alert!) why GPS, the new standard in thermal insulation, is regarded as the better option. GPS vs XPS: Which Is Better? When it comes to the differences between these two products, one of the most notable difference is in breathability. Simply put, XPS is not breathable. It retains water over time. This is due to the way it’s produced with the beads being so tightly joined together, resulting in a much lower perm rating than GPS. So, a double vapor barrier is created when a layer of XPS foam board is placed on the exterior of a wall assembly. Per building code, a vapor barrier has to be on the inside. If you put a layer of impermeable foam on the outside (for more R-value), you then have a vapor barrier on the outside as well. The problem with a double vapor barrier is that it can trap moisture within the wall assembly. Batt insulation can get soaked and sag, creating gaps without any insulation – significantly reducing the R-value of your wall assembly. GPS, however, is permeable and as a result, dries very quickly. In fact, it has a perm rating of up to 5.0 at 1 inch thick, which is more than 4X that of XPS for the same thickness! 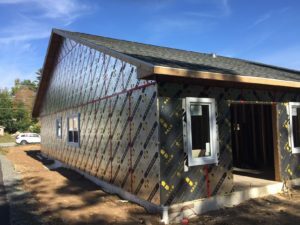 So when a layer of GPS foam board insulation is placed on the exterior of the wall assembly, it allows vapor and moisture to pass through, allowing the wall to dry to outside. Halo® Exterra® is a great example of this. 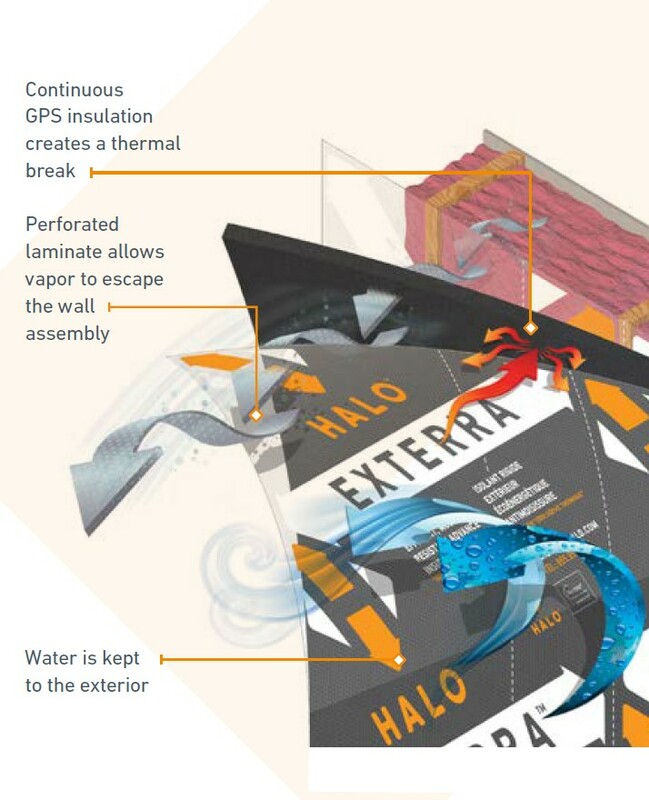 Halo® Exterra® features a permeable GPS foam core covered on both sides with a perforated laminate layer that ultimately allows vapor to escape. This means it maintains a higher air and vapor permanence, which makes it ideal for use as exterior continuous insulation. High and STABLE R-value (4.7+ Per Inch). Convention EPS is a good insulator because it reduces heat flow. But when graphite particles are added, it also reflects and absorbs radiant energy, therein further slowing down the transfer of heat. This then increases its insulation capacity by as much as 18% compared to conventional EPS (it also results in the distinct dark gray color as well). This allows GPS foam board insulation, such as Halo® products , to offer a long-term R-5 per nominal inch (1.06”). You can read more about the different types of Halo® products, which are designed for specific applications, here. While XPS has a slightly higher initial R-value, it decreases significantly over time. This is because the additives (like blowing agents) responsible for giving it a higher R-value escape, therein causing a decrease in R-value. So, actually GPS foam board insulation offers higher long term R-value than comparable XPS products. Greater Sustainability. GPS is resource-efficient (water used in the manufacturing, for instance, is reused many times) and 100% recyclable. With GPS, thinner panels are required, which means that fewer resources are needed to achieve the same results. This is not only better for the environment but results in greater cost savings as well. Further, it’s environmentally-friendly because GPS doesn’t require quarrying for raw materials nor does it contribute to deforestation. It also doesn’t contain CFCs, HCFCs, formaldehyde, borate and other similar chemicals. Pentane, the foaming agent, has zero global warming potential (GWP). GPS is also manufactured locally as well. Less Expensive. XPS tends to be more costly than GPS as well. Greater Versatility. GPS is also suitable for all climates and for a range of different applications, unlike XPS. For example, XPS is not suitable for insulated concrete forms, integrated insulated vinyl siding, radiant flooring OEM products, geofoam used to stabilize soil and one coat stucco (T & G). GPS is also light and yet durable, making it ideal for job sites. While GPS is a new insulation product to both Canada and the US, it has the leading choice in Europe for the past several decades. Offering more breathability, a high and stable R-value, greater sustainability and versatility compared to XPS, it’s easy to see why GPS is being hailed as the new standard in thermal insulation. EMAIL US NOW to schedule an in-store meeting, or call us at 855.350.HALO (4256).